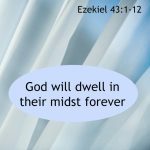 Today’s Passage comes from Ezekiel 44:1-14. Yesterday we saw how we could look forward to Christ and his redemptive work. 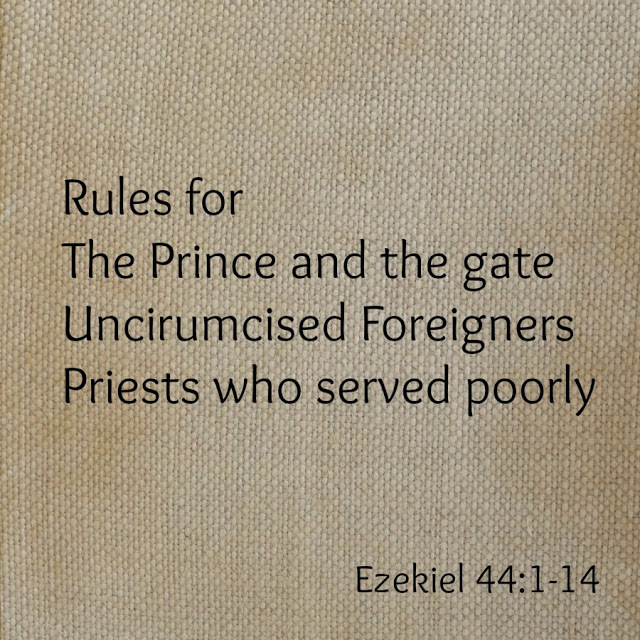 This passage starts off with God making it clear that the eastern gate is only for him. He was the one that entered through it, and he was the only one, therefore who could use it. But a Prince is coming who can use it. That would make the prince equal to God eh? Sometimes it is hard to really understand what God is doing you know? I read these words and I’m left with why? I can understand why those who don’t follow after God aren’t allowed in his sanctuary.. I get that. One doesn’t tend to let enemies into the heart of your home after all. But God has people kill the animals for the sacrifice who had served him poorly in the past. They weren’t allowed to serve him as priest, to enter into that special place to serve HIM. They were punished by only being allowed to serve the people. slaughter the burnt offering and the sacrifice for the people, and they shall stand before the people, to minister to them. 12 Because they ministered to them before their idols and became a stumbling block of iniquity to the house of Israel, therefore I have sworn concerning them, declares the Lord God, and they shall bear their punishment. 13 They shall not come near to me, to serve me as priest, nor come near any of my holy things and the things that are most holy, but they shall bear their shame and the abominations that they have committed. 14 Yet I will appoint them to keep charge of the temple, to do all its service and all that is to be done in it. I think my struggle comes from… why did God allow them to serve at all? Ministering to the people gave them room to minister poorly to the people. Why didn’t God just cut them off from ministering at all? It requires thoughtfulness I suppose. God tells them they will need to bear the punishment for their actions. So serving the people is one step down from ministering to the Lord. They must serve in this capacity knowing they will never have a chance to serve the Lord himself. Only serve the people. I want to get into all the wondering you know…the useless wonderings of “I wonder if it made them resentful or if they bore their punishment well”, “I wonder if they took their resentment out on the people”. Wonderings that don’t really further learning from God but just fill my mind with speculation. I just hope that the priests bore up their punishment and accepted their shame well. Which of course brings me to this: When you do something wrong and the Holy Spirit calls you on it, do you correct yourself? Do you bear up well under your guilt or do you make excuses? 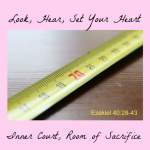 I know what I am prone to do….I grumble and complain and say but … but…(excuse excuse) but eventually I admit my guilt and say “Sorry…whether it’s just to the Lord or to the person that I wronged.” It just sometimes takes me a while. temple of the Lord and all its laws. And mark well the entrance to the temple and all the exits from the sanctuary. This verse has me thinking that God will be laying down some rules for his people that Ezekiel had best pay attention to. More than just the rules about the uncircumcised foreigners and the priests who serve only the people. 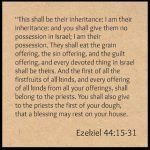 You can read more in my Ezekiel Studies here and here.